The SS-D10is Razertip’s workhorse, with many features not found on any other burner. Dual handpiece capability allows you to have 2 pens plugged in at the same time and change between them at the flick of a switch. This is particularly useful if your work calls for frequent handpiece changes as it saves time as well as wear on the connectors. The SS-D10’s extra low-end temperature adjustment allows you to turn the heat down further if the “1” setting is still too hot. If you are sculpting wax or detailing plastics, you’ll love the extra range available on the low end of the SS-D10. The only difference is the HD has a heavy Duty pen and cord HD1L or any pen of equal value. Unconditional warranty covers everything (and we mean everything!) for 3 years on the power supply and one year on all handpieces including fixed tips. Even if you drop your pen and break the tip – it is covered! The SS-D10is Razertip’s workhorse, with many features not found on any other burner. Dual handpiece capability allows you to have 2 pens plugged in at the same time and change between them at the flick of a switch. This is particularly useful if your work calls for frequent handpiece changes as it saves time as well as wear on the connectors. The SS-D10’s extra low-end temperature adjustment allows you to turn the heat down further if the “1” setting is still too hot. If you are sculpting wax or detailing plastics, you’ll love the extra range available on the low end of the SS-D10. Don’t let the SK’ssmall size fool you. Packed with the same power and CSA NRTL/C certified circuitry as the SS-D10, the SK is great as a starter unit or as a second burner for the serious artist. So what’s the difference from the SS-D10? The SK will accept only one handpiece at a time, making it necessary to unplug and plug in handpieces when changing over, and it’s lacking the extra-low-end temperature adjustment. Other than that, it’s essentially the same unit as the SS-D10. The only difference with the SKHD is a heavier cord and Pen. Comes with a HD1L pen or any of equal value. Don’t let the SK’ssmall size fool you. Packed with the same power and CSA NRTL/C certified circuitry as the SS-D10, the SK is great as a starter unit or as a second burner for the serious artist. So what’s the difference from the SS-D10? The SK will accept only one handpiece at a time, making it necessary to unplug and plug in handpieces when changing over, and it’s lacking the extra-low-end temperature adjustment. Other than that, it’s essentially the same unit as the SS-D10. Comes with F1L Pen or any of equal value. If you have a woodburner now all you really need is the base unit. All your pens will work on it. “Revolutionary” is the word we have heard most when people experience the Razertip P80 for the first time. 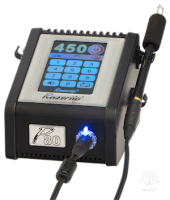 The P80 is the world’s first pyrographic tool to incorporate a fully regulated, stabilized power supply (100-240VAC; 50 or 60Hz) and a digital touch-screen interface. 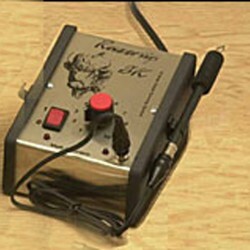 Plug it in anywhere world-wide, input your desired heat setting and you are burning away in just a few seconds. With 700 heat settings the P80 can be set low enough to work with jeweller’s wax (approx. 80 degrees C) to red-hot (800 degrees C). Voltage fluctuations do not phase the P80 at all – the tip temperature at your chosen heat setting stays rock-steady regardless of what is happening with the power available. The P80 offers better-than-ever tip heat recovery, and is compatible with all existing Razertip pens and accessories. Each P80 or P80x includes an extra-flex pen cord (#CORD1P) which works beautifully with any Razertip pen or tip. The P80’s unique power output means that heavy-duty cords are no longer needed to make a difference when burning with heavier tips. The P80 is a single burner – but with a huge difference. Want a dual or triple burner? Quickly and easily add up to two P80x expansion modules (no tools required) for a versatile system that gives each pen its own heat setting and memory function. Toggle between pens by touching the screen you wish to use. As with everything we make – the P80 is proudly made in Canada – right here at our facility – it is covered by our exclusive 3-year unconditional warranty, and it is safety-certified virtually world-wide. By simply changing the power cord*, or using a suitable plug adapter, you can use your P80 anywhere. * safety-approved IEC C8 power cord for the country where the unit is being used. 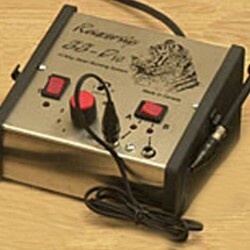 fully regulated, stabilized power supply and a digital touch-screen interface. Temperature range: 340°F (80°C) to 1400°F (800°C) approx. compatible with all existing Razertip pens and accessories.